Click on picture to make it larger. lightweight 3/8 inch back. The back is internally braced – I would not change it back to the original one (included) unless you are a purist or are real fussy. The tuck and roll has some cuts that have been repaired – you can see them close up, but it looks fine on stage. (Click on the pictures to make them larger. Keep in mind that pictures can make things look a little better than they really are.) The speakers have large JBL aluminum voice coil covers (attached with speaker glue). On stage it does draw a little attention – sometimes I would see people looking at it. Plus it is very lightweight, so it makes a good gigging speaker. 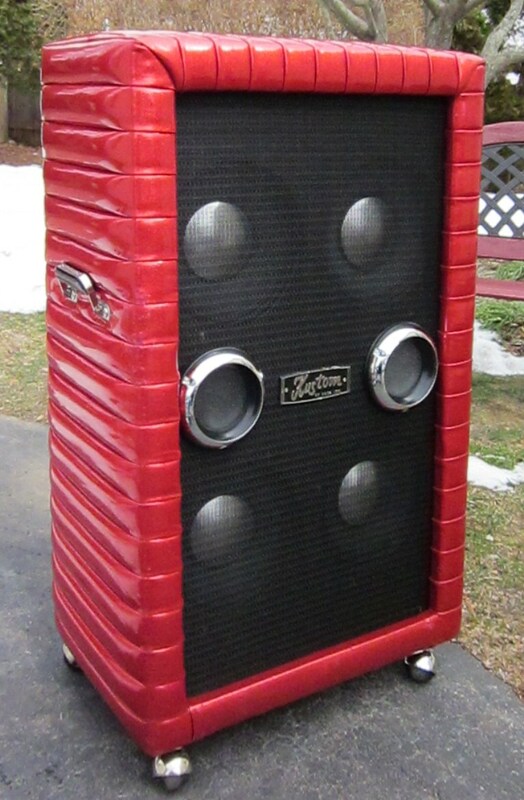 This speaker cabinet is two inches less wide than the later Kustoms, so it is easier to transport. It will easily fit in the back seat of a 1995 Maxima or 2005 Accord, for example. 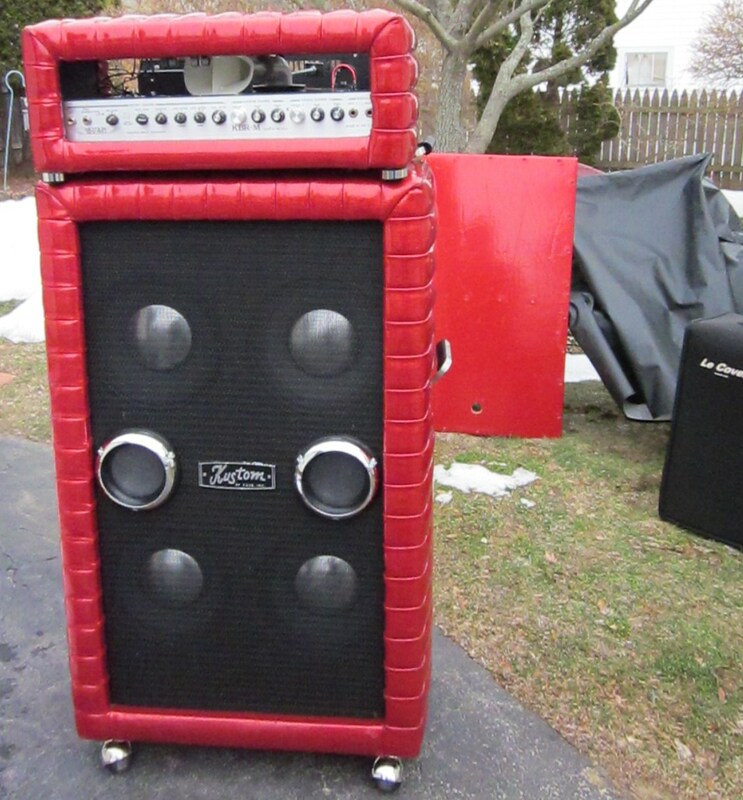 The cabinet is good for bass guitar or keyboard. 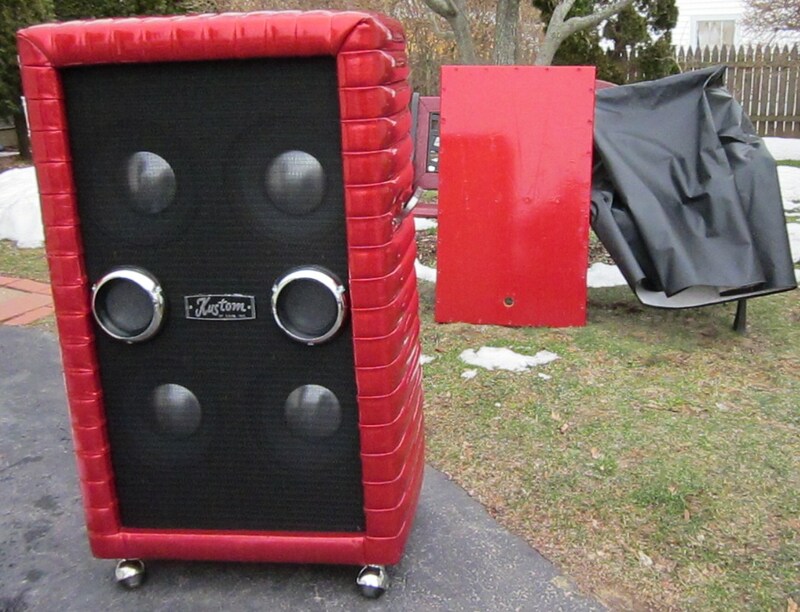 I used it for keyboard and it was the best speaker I ever had – after getting this cabinet, I quit buying Kustom tuck and roll speakers – I had found what I was looking for. When you hit the low notes with an acoustic piano patch, it is strong – people will notice. I used only electric piano sounds (avoided acoustic piano) before I got this cabinet. One handle is original, good condition, plastic unbroken, chrome is very good. One handle is replacement from Monument Music. Casters are original, not perfect but solid condition, chrome is fair, rolls well. The grill is in excellent condition. The Kustom nameplate is the correct “Ross” nameplate and is in excellent condition. Tuck and roll is in good condition overall – not perfect. The worst is the 5th through 8th pleat (from the top) on the left front panel and edge – besides this, the left side is very good overall. The cabinet top and right front and edge are very good. 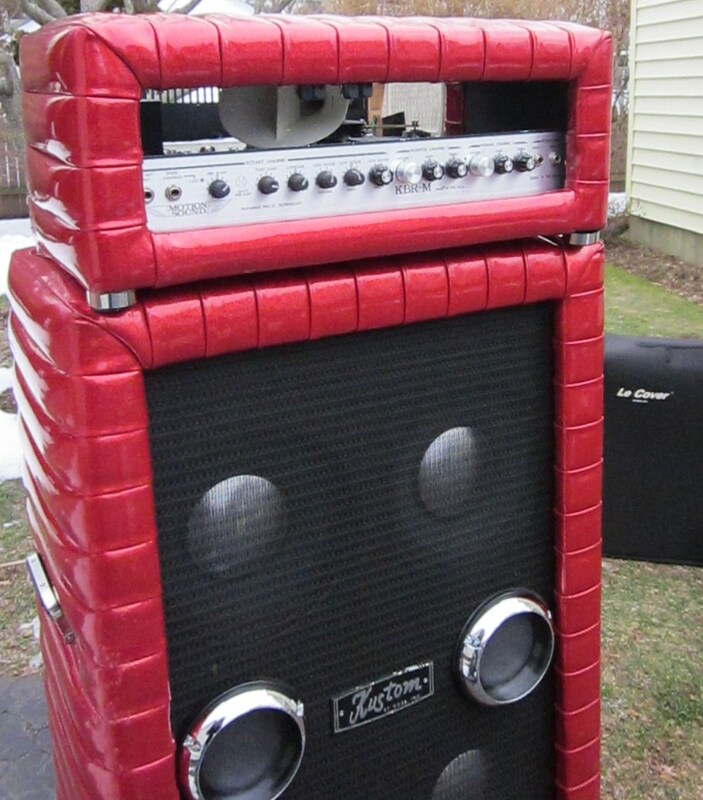 The top does not have dents from a heavy amp sitting on top. The right side is very good. The back edges are worn. The original back is solid, the tuck and roll has a few tears that have been repaired. It has two built-in amplifiers – a 45 watt amp for the spinning horn (the higher frequencies) and a 130 watt amp for your speaker cabinet (the lower frequencies). So you get a real Leslie effect from the horn and a simulated Leslie effect from your speaker cabinet. External speaker cabinet needs to be 8 ohms. 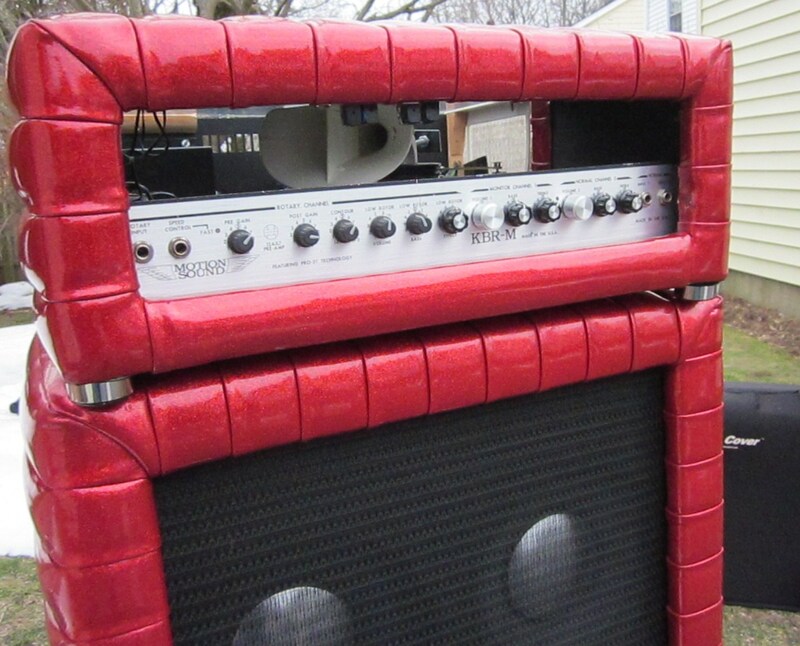 The 130 watt amp is actually 2 amplifiers that are bridged, so it is important to use an 8 ohm (or higher) speaker. Using a 4 ohm cabinet could overheat and possibly damage the amp. Your external speaker will play the lower frequencies, so a good speaker is important. 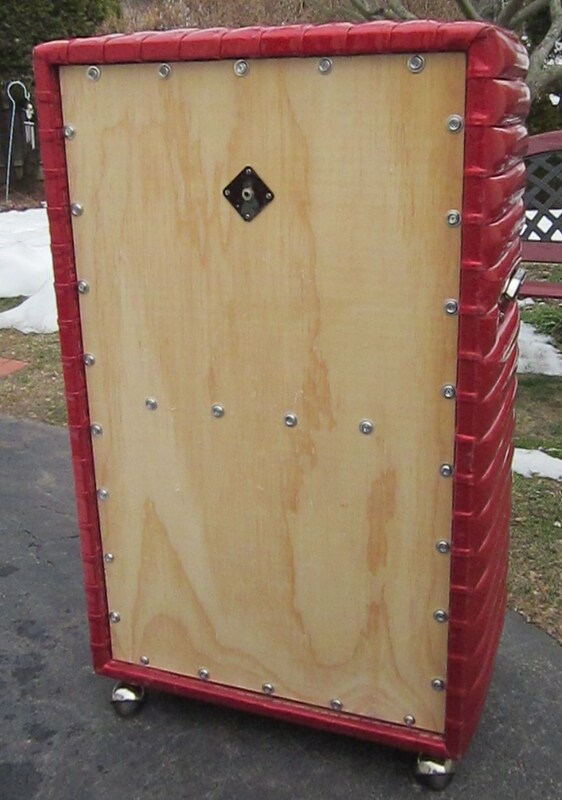 A 4×10 cabinet will sound bigger and more realistic than a 1×12. 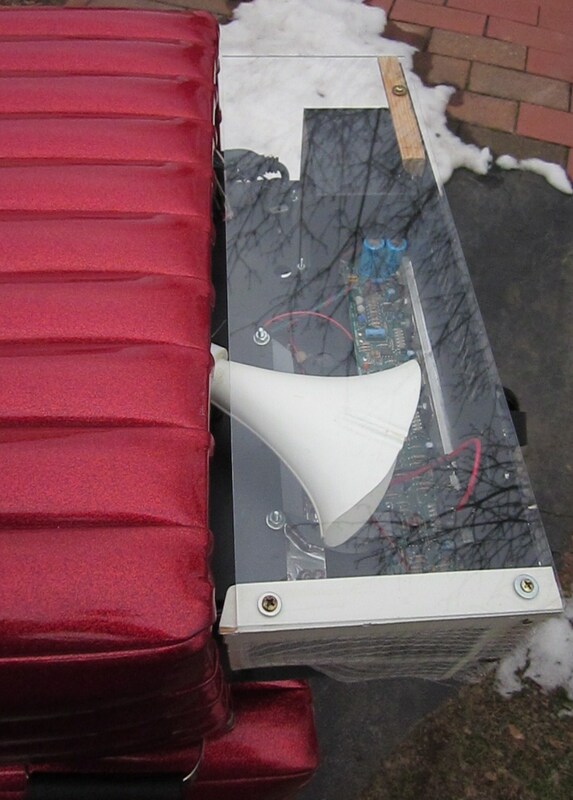 The Motion Sound rotary assembly is sort of deep so it sticks out about 8 inches from the back of the K100 cabinet – that part is covered with Plexiglas so you can watch the horn spin. Basically, six knobs are for the rotary section, and six knobs (volume, bass, treble) are the two non-rotary channels. 1) Pre-Gain sets the amount of drive to the 12AX7 tube for overdrive/distortion. The Rotary Channel Crossover is 800 Hz. The low rotor simulator is mixed into the Hi-Fidelity power amplifier. The Rotary horn has a built in microphone with level adjustment to the XLR line output. 4) Low rotor volume adjusts the balance between the horn and low rotor simulator. 5) The bass control EQ is at 100 Hz. 6) Low Rotor effect adjusts the level of the simulator. Speed control is via footswitch -Fast, slow, and stop. I added another switch to the footswitch so it can be placed on top of a keyboard and operated by hand. The Monitor channel (1) has one input, volume bass and treble controls. The rear panel has a switch to disconnect the XRL line out signal for Vocal monitor. The Normal channel (2) has one input with volume, bass, and treble controls. The rear XLR line output contains the rotary channel’s horn microphone and low rotor simulator along with the Monitor channel (if the line out switch is on) and the normal channel. Hi-Fidelity/low rotor simulator amplifier = 130 watts RMS. 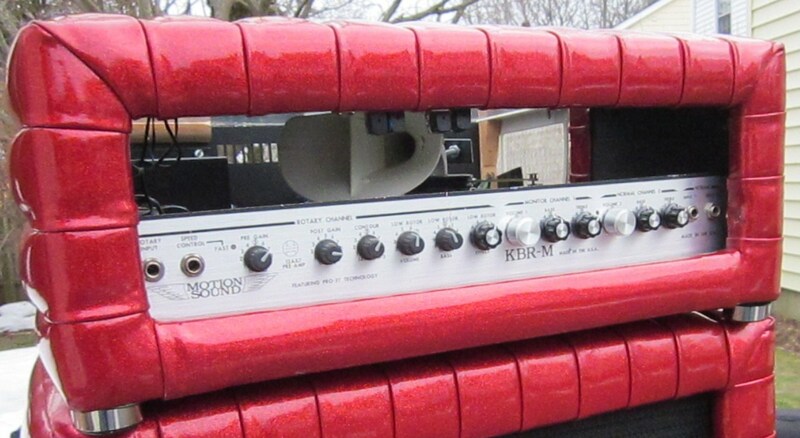 This model is from 1999 and I have to give Motion Sound a lot of credit for how well this unit works and its complexity – it contains a real horn and motor, motor controller, two amplifiers, a tube preamp, 3 channel preamp/mixer, active crossover, low rotor simulator, microphone, and XLR-out. If you open this link, then click on the picture to enlarge it – you can see the four LED pods in the upper front part of the cabinet. The red tuck and roll is in fair to good condition. The tuck and roll has some cuts that have been repaired – you can see them close up, but it looks fine on stage.